Granite Creek is an important area of habitat for salmon and the people who have relied on them for thousands of years. Commercial placer mining through the 1940s left the floodplain and channels severely disturbed and destroyed almost all fish habitat. Our river professionals identified large woody material (LWM) as a critical element in restoring natural processes. The project area included approximately 5,300 feet of channel from Grant County Road 24 to beyond the confluence with Clear Creek. By carefully designing the LWM type, size and location, the team created functional and naturally sustainable river and floodplain habitats—capable of regulating themselves and evolving over time. Designing a sustainable river ecosystem capable of supporting the region’s critical fish species. 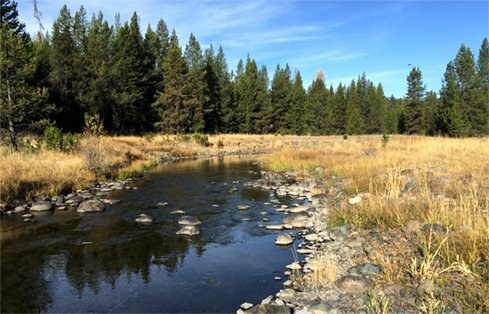 Granite Creek, located about 1.5 miles northwest of Granite, Oregon, is an important area of habitat for salmon and the people who have relied on them for thousands of years. The ecosystem has been impacted by human activity since the mid-19th century, when trappers, mineral prospectors and the timber industry began to operate in the region. Commercial placer mining through the 1940s left the floodplain and channels severely disturbed and destroyed almost all fish habitat. 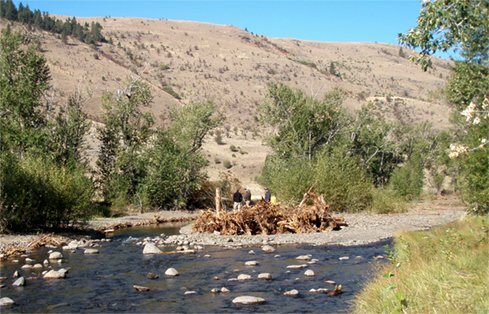 The Confederated Tribes of the Umatilla Indian Reservation (CTUIR) wanted to restore the reach’s habitat to once again support the diverse fish, wildlife and botanical communities that are central to the tribes’ traditional lifestyle. 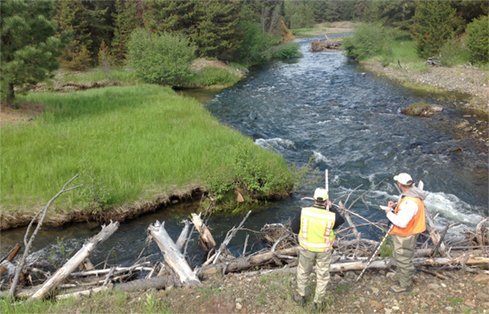 CTUIR hired GeoEngineers to perform geomorphic and habitat assessments, and complete conceptual, preliminary and final construction drawings for specific river restoration strategies. Designs included main channel and secondary channel geometry modifications, levee removal, large wood habitat structures, floodplain dredge pile grading and a revegetation plan. The project area included approximately 5,300 feet of channel from Grant County Road 24 to beyond the confluence with Clear Creek. After comprehensive geomorphic and habitat assessments, GeoEngineers developed a restoration plan for the reach. Our river professionals identified large woody material (LWM) as a critical element in restoring natural processes. By carefully designing the LWM type, size and location, the team created functional and naturally sustainable river and floodplain habitats—capable of regulating themselves and evolving over time. The LWM restoration plan included approximately 2,065 pieces of LWM placed at 286 different locations in 8 distinct types of large wooden structures, ranging from individual to multi-log accumulations of various sizes. All of the LWM are stabilized with earthen materials, and constructed without the use of any artificial cable, chain, shackles or similar mechanical anchoring devices. 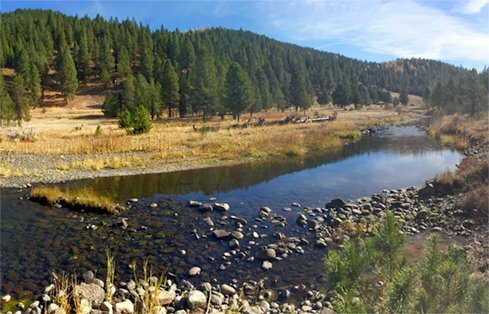 Although final construction isn’t expected until 2019, GeoEngineers’ comprehensive habitat analysis and river restoration plan will guide CTUIR and their contractors through project implementation. Carefully designed LWM and other habitat features will create a sustainable ecosystem capable of supporting the region’s critical fish species.